Year before last, I had made a few turtle necks and I could not remember which pattern I had used. This winter I wanted a few mock turtles to wear as long T shirts during the winter. I made these the last 2 weeks of December. In North Texas then, the temps were up in the 60's to 70's with more of a West to South wind. Anything up here in the West or Southerly winds is usually a warmer crisper day. I tried View A in a cotton jersey knit. The mock neck view. I am really out of practice with my blogging pictures and clothing blogging in general. The finished version of the long sleeve, mock turtle was that it was a looser fit, which is fine , but not the closer fit I remembered. On my sleeve hems and finished length hem, I used a basic zig zag, and I am very happy with it. 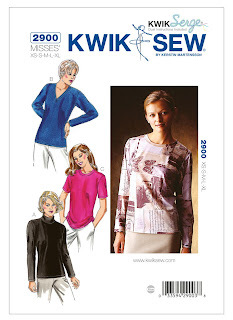 I did not serge this T. It's a lightweight cotton knit and I wanted to just use the sewing machine. Another view of the top. I've worn this twice, but wanted to wear it more often. The temps have been in the 20's just for this week, and these tops are perfect for inside and out with a coat. The curtains and the window ledge pad I made during summer when I was feeling better from my 3 and 1/2 month cold. I think I winged it with the pad, but the curtains came from the Craftsy class, Sewing for the nursery by Vanessa Wilson, I think. I rewatch that class with every window project I do. I don't think I've reviewed any of the projects. There is a 16 inch overlay in the middle of the curtain on purpose because even though our one story house is up on a little hill, it's a flat little hill, and you can walk up to the window and look in. The windows are triple pane with a gas layer between 2 of them and that makes it hard to see through, but I still wanted the extra layer. I used stash fabrics and matched up prints and solids and made another set for our bathroom too.